You know what is 4G? 4G is the fourth generation of wireless mobile telecommunications technology. In short, it’s the name given to the fourth generation of mobile networks, just as the previous mobile technology is called 3G. 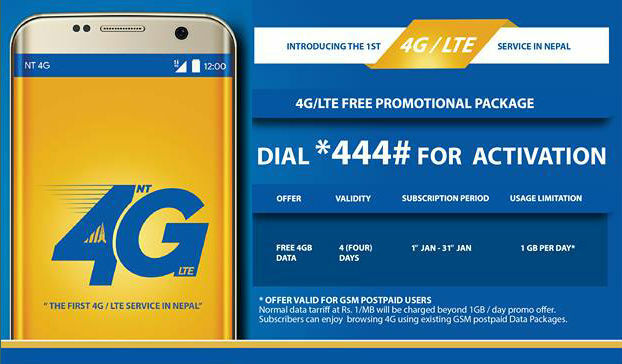 Nepal’s leading telecommunication company Nepal Telecom has started (Jan 1st, 2017) 4G internet service for mobile users. Nepal Telecom’s phone subscribers can activate a super faster 4G internet for their mobile. Theoretically, it can provide download speeds of up to 100 Mbps. 4G network is also called everything and everywhere. OMG! The faster speeds mean websites load quicker, and that you’ll be able to stream videos and podcasts without first waiting for them to buffer. Are you excited now? If so you can activate 4G in NTC Prepaid/Postpaid mobile. Finally, the prepaid user also can use free 4G for four days. The free promotional package will be available from Feb 4 to Feb 18, 2017 (22 Magh to 7 Falgun). The prepaid user will get everyday free 1GB data for four days. Another important is now 4G internet only available in Kathmandu and Pokhara. The bandwidth that you have over there seems amazing, in my country we have 1 Gb for a month not a day, we can get at most 10 Gb but we have to pay a lot of extra.